Tanja Kunz says that she likes pretty places. She also likes light, wildflowers and the color green. 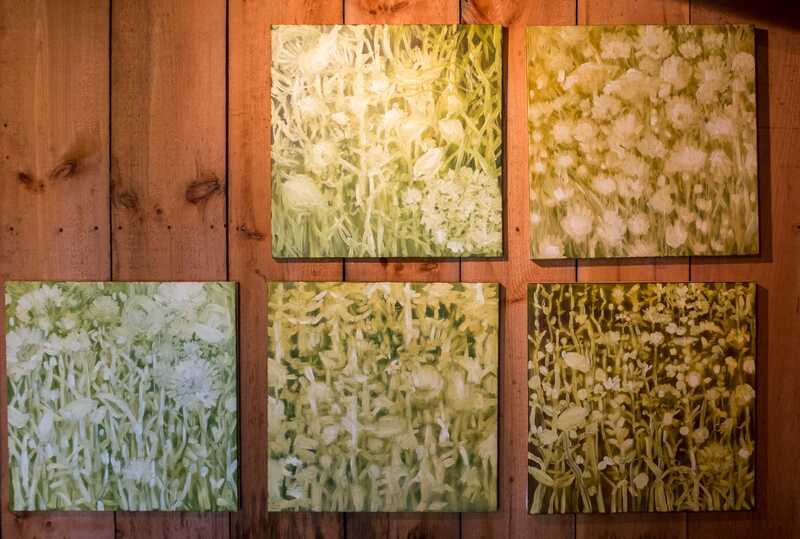 Her artwork—botanically-referenced yet abstract paintings and drawings—reads like photosynthesis distilled. Energy emanates from each canvas, as movement, illumination or both. 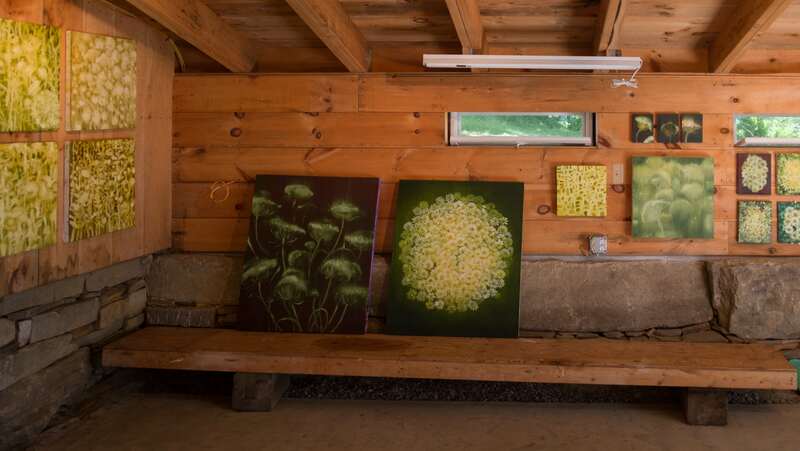 The first painting of Kunz’ that caught my eye was from a series depicting Queen Anne’s lace—a flower perhaps more familiar as “wild carrot” or “bird’s nest” or even “bishop’s lace,” depending on where your mother grew up. 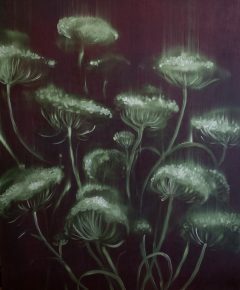 On canvas, the delicate blooms seem to stretch slightly larger than life, though their size is ultimately ambiguous; the petals grow and shrink with a tilt of the head. Kunz describes this fluctuation as the work’s generosity to the viewer, and a quality of the paint that is impossible to reproduce in a photograph. 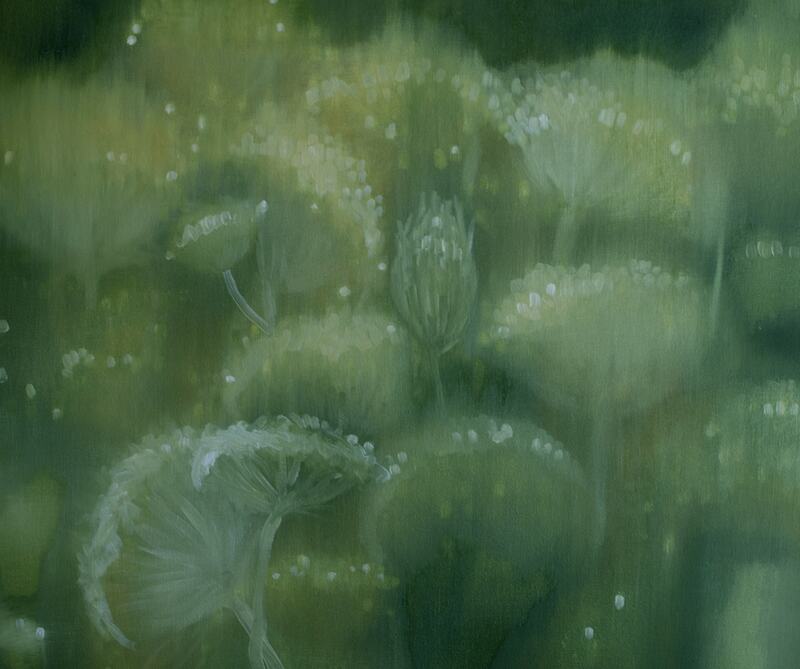 Behind the flower’s precisely rendered umbels, broad streaks of light flood into an otherwise muted background. Here, there is a breeze. There is juxtaposition of focus and gesture, and a tension between abstraction and representation. Also of note are Kunz’ field studies. They too feature Queen Anne’s lace, but this time acrylic on paper and monotone. Despite the limited color palate, they remain luminous, drawing the eye even from their placement in the corner of the room. Imagine cyanotypes but without the cyan. Each work is an exercise in form and line. Kunz says that her field studies are a way of returning to a subject with a different language. She thinks of everything she has ever painted as one large work in progress. A circle, not a line. Unlike many artists, quick to intertwine explanations of their work with references to their own biographies, Kunz is decidedly private. She is interested in traditional and herbal medicine. 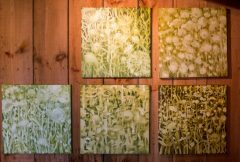 She studied cell structure through painting to earn her MFA. She has lived in New Mexico and Texas and, now, Maine. This is all. What she has to say, she says through her art.